Now being packaged in five different quantities for your convenience. 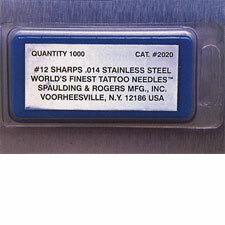 This exceptionally quality controlled needle will be sure to meet with your approval. We use all the latest custom designed high tech equipment in the manufacturing of these needles. If you now have a needle problem, chances are, we can correct it for you. Available in packages of 50, 100, 250, 500 and 1,000. Stainless Steel Flux #2033 is recommended for best results.